The Giriama of Kenya's coastal hinterland persistently resisted colonialism, and they were unreceptive both to Christianity and to Islam. 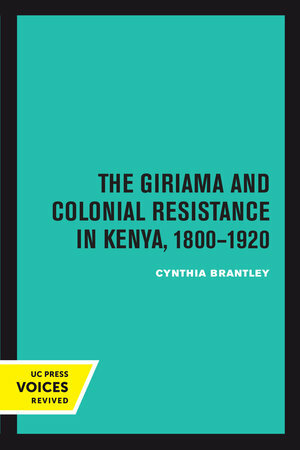 In 1912 the British colonial authorities earmarked the Giriama as a key source of labor for the plantations Europeans were trying to develop along the coast. The Giriama, prosperous producers and traders, could not become wage laborers and maintain their successful economy, and the British demands upon this scattered people therefore were spontaneously rejected. Increased pressure increased Giriama recalcitrance. Finally, military action brought defeat to the Giriama, whose only weapons were bows and arrows and whose decentralization prevented coordinated resistance. They lost their best lands, paid a heavy fine, and had to contribute a thousand laborers to the Carrier Corps. But the British costs were also heavy. The coastal plantations failed, few Giriama ever became wage laborers, and the entire area became depressed economically. Cynthia Brantley explores the precolonial Giriama's political and economic system and their dynamic trade relationship with the coast of Kenya in an effort to explain why the Giriama were so determined in their resistance to British pressure. She shows that even when the political and social structures of a people seem weak, it is unlikely that the population will submit to changes that undermine the economy. Moreover, their very lack of a centralized political or religious organization made the imposition of foreign administration extremely difficult. The British won the war, but their victory was hollow. Cynthia Brantley is Professor Emeritus of History at the University of California, Davis.